One of the great things about Paris is the importance locals place on art. This is, arguably, the centre of the artistic universe. 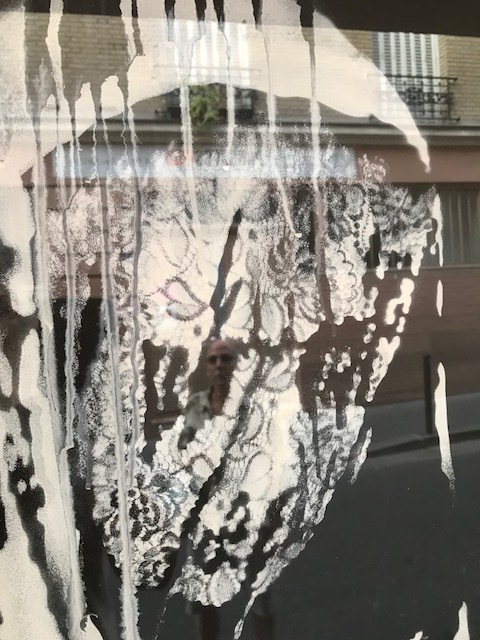 It doesn’t matter if we’re talking about the Louvre Museum–once the seat of government, now the property of the common citizen thanks to the guillotine–or the ice cream shop where cones are sculpted into roses in bloom through a painstaking production of artistic expression, Parisians take their art seriously. You’ll find a group of middle schoolers on a late night tour at the Louvre hang in’ with adults and soaking it all in on a Friday night. The only thing I soaked in on a Friday night at that age was booze and punishment. So perhaps there is no civic canvas for the likes of Banksy. The anonymous urban graffiti artist is world renowned and still unknown. I clued into the genius and unmistakable style of Bansky from the 2010 documentary, Exit Through The Gift Shop, which he or she (nobody knows) directed without detection, no small thing. As a guerrilla artist, Banksy is a god. 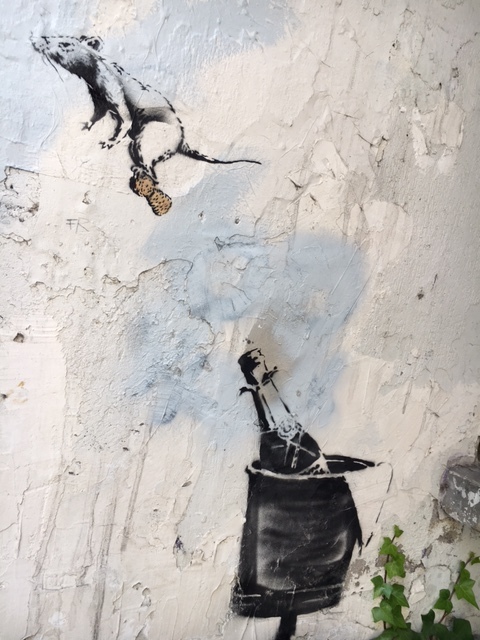 I’ve had the great fortune in this past week to go on a Banksy treasure hunt where his pieces hide in plain sight. I must thank first thelocal.fr for clueing me in on the location of most of these pieces. and second, my wife for looking up in the air at just the right time. It’s evident that on this pilgrimage not everyone is bowled over or even aware of what they are seeing, as evident by the wow-that’s-weird look they display as they hustle by to the Louis Vuitton store. But I also ran into the enlightened few sharing my pursuit. We exchanged information and shared photos. They know what time it is. Please enjoy these shots from top left to bottom right. A riff on the famous 1801 painting Napoleon Crossing the Alps in the 19 Arrondissement, a mile from my flat. 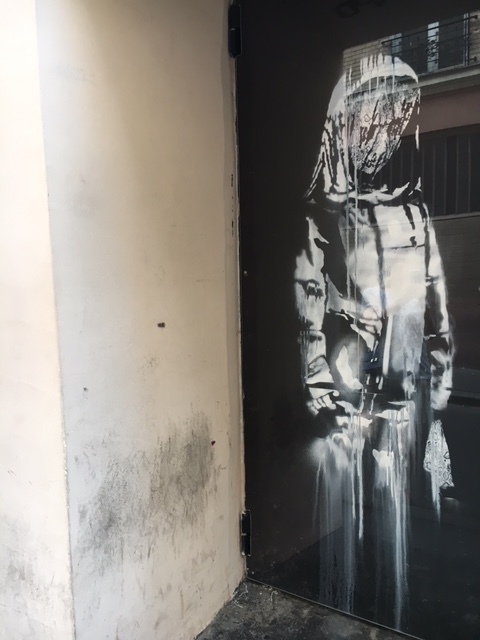 Girl in a shroud, on the side of the Bataclan nightclub where the 2015 terrorist attack took place. I’ll say hello from the left eye. Rat with a red polka-dot bow, about a block away from Shakespeare and Co. where I belong to a Sunday night writers’ group. Rat shot out of a bottle of champagne, in the Marais, around the corner from my favourite falafel joint, Mi Va Mi, on rue de Rosier-dinner for one, 6,50 Euro. 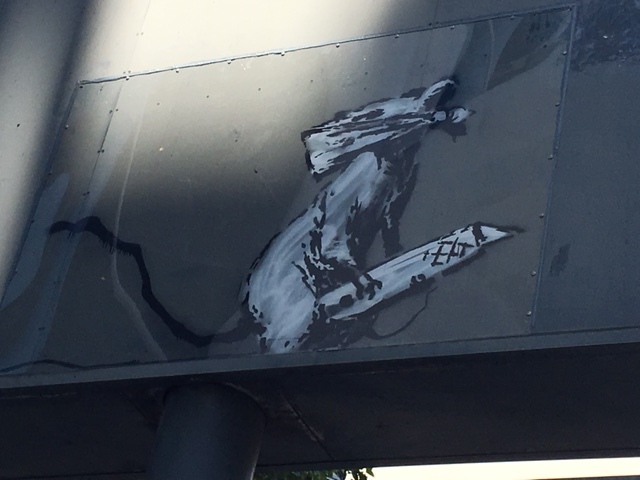 And lastly, as dumb luck would have it–discovered by my wife on the back side of a sign in front of the George Pompidou Centre where I utilise the library to work on my novel– a blindfolded rat riding a box cutter. A reference to 911 maybe? All of these pieces are a week fresh and have been protected behind a sheet of plexiglass. Unfortunately, one piece was defaced and didn’t make it. 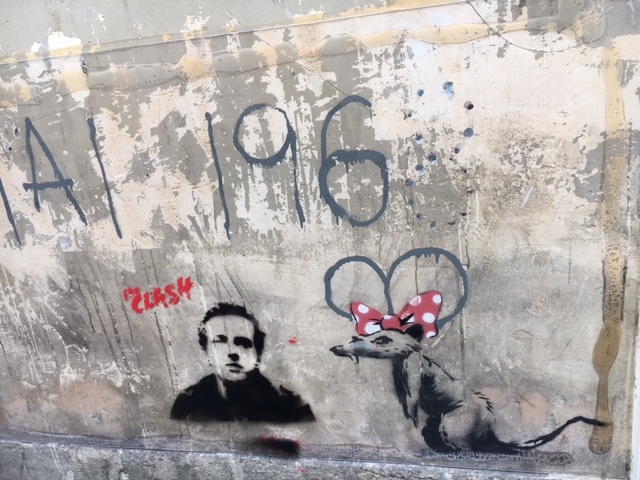 Be on the lookout for guerrilla artist Banksy coming to a metropolis near you.